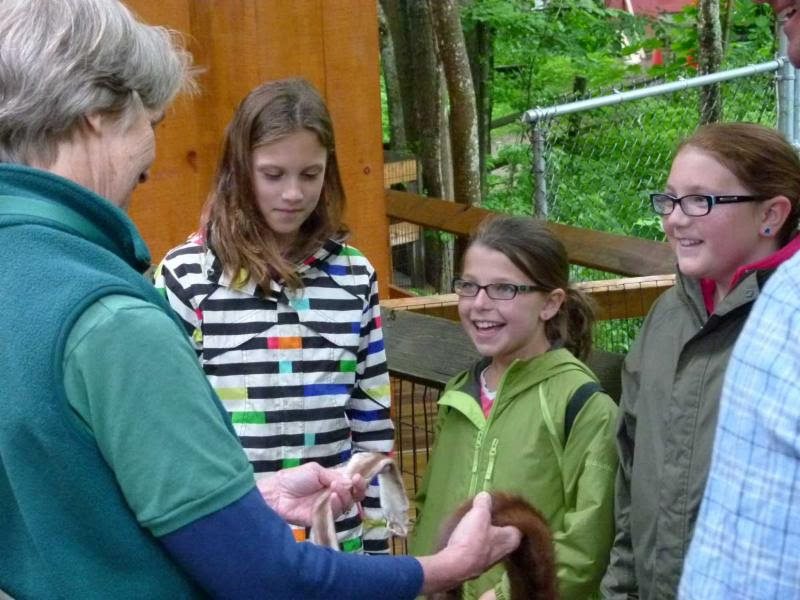 Holderness, NH – Each year volunteers at Squam Lakes Natural Science Center donate their time, energy, and expertise to support the education mission of the Science Center. Volunteers help in various capacities and areas including animal care; education docents; education programs; exhibits; trails and campus; Kirkwood Gardens; greeters; office; special events; First Guides teen volunteer program; and more. In addition, volunteer groups from local businesses, schools, and organization provide assistance on individually scheduled projects throughout the year. For people looking to get involved with the Science Center, volunteering is a great way to become part of the community. In 2018, a total of 311 volunteers gave 8,632 hours to Squam Lakes Natural Science Center. According to the Independent Sector*, a nonprofit organization that calculates the value of volunteer hour state by state, the Science Center volunteer service hours have a monetary value of over $220,000 for the year. Approximately 63 million people volunteer in the United States annually donating about 8 billion hours of time. The value of volunteers in the U.S. is approximately $197.5 billion. Volunteering at Squam Lakes Natural Science Center is personally rewarding but also offers benefits for the volunteer including monthly luncheons and educational programs, a gift shop discount, a membership discount, free trail admission on the days a volunteer is volunteering, use of the education library, volunteer newsletter, and an invitation to the annual Parsons Volunteer Recognition Dinner. As spring approaches the Science Center begins various volunteer trainings to prepare for the public trail season beginning May 1. In April, Volunteer Instructors learn to assist educators in school programs and Lake Education Assistants learn to assist school programs aboard pontoon boats. Adult Docent Training takes place in June for volunteers looking to become more deeply involved with the Science Center. Docents are trained to interpret the live animal exhibit trail and New Hampshire’s natural world and act as a welcoming and informative presence for visitors. Teen First Guide training will be in late June for ages 14 to 17. First Guides assist docents and participate in a Community Action project during the season. To learn more about volunteering at Squam Lakes Natural Science Center please visit www.nhnature.org/who/volunteer.php .